The Story Behind the Story: a True Hero? What if a hero isn’t a true hero? This was my starting point when I came to write my dark comic short story Shopping at Tesco. They say you should never meet your heroes, the simple reason being that in reality few people measure up to the hype, and it was with this cynical thought in mind that I listened to news of the Hudson River hero. ack in January 2009 (yes, I wrote the first version of Shopping at Tesco that long ago), American pilot Chesley “Sully” Sullenberger was hailed a hero after successfully making an emergency landing of Flight 1549 in the Hudson River, New York, after the plane hit a large flock of geese, disabling both engines. All 155 passengers and crew survived. It was the perfect good news story and there aren’t many of those, but at the time my initial thought was, I hope the pilot is up to his new role as the US nation’s hero. Well, of course it turned out that he deserves all the adulation he has since received: an outstanding scholar, president of the high school Latin club, an experienced pilot with 40 years and 20,000 hours of flying experience, an air safety expert, successful author and a happily married family man who friends describe as “shy and reticent”. In other words, Sullenberger is an all round good guy. But, what if a hero who becomes a hero suddenly and accidentally isn’t so great? Shopping at Tesco evolved from this simple question. The plot formed subconsciously in a dream that was further developed until Joanna, my “Tesco hero” who isn’t a true hero, came to life. 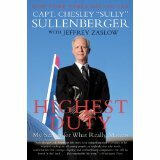 Meanwhile, Chesley “Sully” Sullenberger is so much a true hero that a film based on his life is to be directed by Clint Eastwood, and if there’s one thing Clint knows about it’s heroes.